I wanted to share this very cool shot taken by my brother with his new Cannon Rebel Digital Camera. Lacking a telephoto lens he was lucky enough to get to within 10 feet of the hawk and snap a few shots. Apparently all the duck hunters in Maine were enjoying the last day of the season! Take Care Everyone & Merry Christmas! 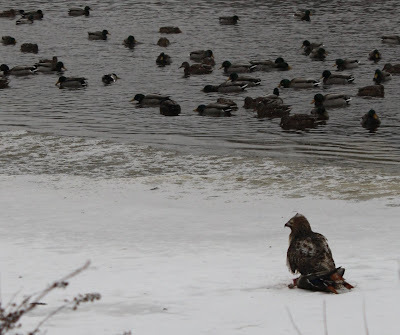 What an awesome picture.My guess is the only reason he got so close was because the hawk didn't want to give up it's hard earned meal.The mallards have beautiful color as well. Great shot! I have at times lost out recovering a crippled duck to speedier and stealthy Eagles. The pressure for food is really on in the depths of winters grip. TBD and TS - You may find it interesting that in years past we have had decoys partially sunk by unsuspecting eagles punching holes in them. Seeing them fly away with that look of "what just happened" is priceless.